Comfortable, modern guest accommodations use a host of reclaimed materials to accomplish the owner's objective. The objective as outlined by the owner, was to create a place that would help his wife enjoy time in Montana as much as he did. 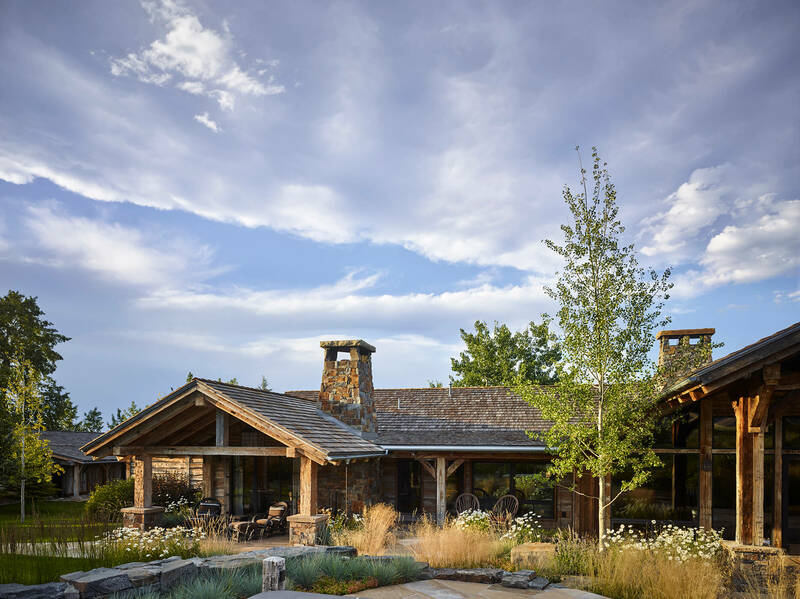 We encouraged her involvement—she was an interior designer, after all—so together we designed a ranch compound with a main house, guesthouse, horse barn and fishing cabin. Using a host of reclaimed materials—stones from tailings at a nearby abandoned mining operation, reclaimed wood for accents as well as antique railroad lanterns for exterior lighting, we were able to a create place that has resoundingly accomplished the owner’s mission. Originally constructed in 1912 by Swedish homesteaders near Ennis, Montana this cabin was disassembled and brought back to life as comfortable, modern guest accommodations. With a trout pond down a steep slope, the owners wanted to add a small shelter to enhance time spent by the water. A place equally suited to escape a quick storm or take a nap. They also wanted this small retreat to blend into the surroundings. A sod roof and indigenous materials such as displaced boulders from nearby mining tailings delivered on all counts.